my names marie but most call me by my forum name 'funkers' lol. as all my chooks and pigeons and horses have hairy legs! I've owned dusty a African grey for 3 weeks now. I am told he is two and i'm his third owner I know of! you where recommended by jack the goose on fb. lol. dusty took to me straight away and has settled quickly with the family. but of course has issues I wanna sort. he appeared itchy so I got a spot on but hes a plucker! I've scrubbed his cage down and brought that f10 ??? as his perches had never been done. moved it all about. not sure how much time hes had out. not very good at step up etc and will grab (not hard-my conure was worse) your fingers. mostly just letting him have time on top his cage as he cannot fly and wont step up on a perch. so there'll be lots of brain picking from my end. 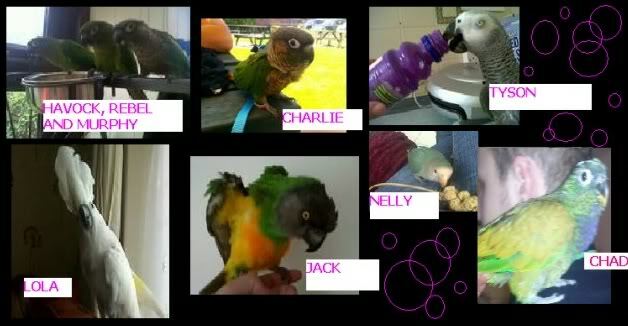 altho I've had show budgies. cockatiels and kakarikis ?? (sp) and the evil conure. (would whisper I love you in your ear then then try to chew your face off or hands . anyway all fun. at least we got him swearing less now! Re: HI from me and dusty!! Hope this helps, and bring on the questions, we're here and looking forward to getting to know you. did you say you had spot on? As in the flea stuff for dogs? I'm not sure you can use it on parrots, I could be wrong though I've never heard of it being used, there is soething else for birds, Scarletts will have it, I'm sure or phone your nearest, or any avian vet and ask them what it's called. As Sue says, as warm spray daily should sort him out, even if he doesn't like it, keep doing it. Greys are notorious for hating baths and showers. We expect lots of photo's and whats his name? You will get lots of help and advice on here, so do ask even if you think it could be a daft question. Aw bless him The start of things to come. send it to me and I'll put it up. oh and 'der' when I asked his name! It's pasted all over the title!! margy wrote: send it to me and I'll put it up. Hi Marie!! Told you you'd be welcome here and lots of experience to draw on!! Welcome and you have come to a great place for support. Well done for giving Dusty a new start. Hello Marie and a very warm welcome to a wonderfull site. Welcome to the forum dusty and Marie!